The annual Jayne Wilson Memorial Arts Competition and Exhibition always draws a crowd. Next year's exhibition will feature the theme "laughter". For many, progress on the journey of healing can be measured by the return of laughter, the theme chosen for the fifth annual Jayne Wilson Memorial Arts Competition and Exhibition. The First Floor Program is calling for entries in any artistic medium, with prizes in open, youth and children’s categories. Jayne Wilson established the First Floor Program, for families impacted by substance use, mental health issues and suicide, in 1996. 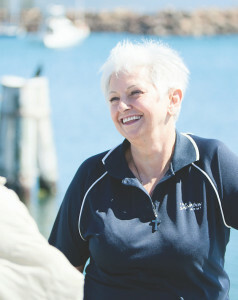 Jayne (pictured right), who was also a well-known police chaplain, serving the Lake Illawarra Area Command, its officers and their families for seven years, passed away on Christmas Day 2013 from cancer. In order to celebrate Jayne’s service to the local community, the annual art competition and exhibition was established in her honour. “We wanted to involve the community in honouring Jayne’s legacy; she loved art and used it frequently in our support groups and programs, so this was a way we could combine these elements and celebrate her passion for family, recovery and hospitality,”says Marilyn Dunn, coordinator of the First Floor Program. The exhibition, which now features works from all over Australia, is organised in conjunction with the Wilson family, who will judge the winning competition entry in the Wilson Family Award –for the work that best represents Jayne. This year’s exhibition will also feature a collection of new work by Wollongong artist Gennifer Anderson, who won the Wilson Family Prize in 2017. Gennifer’s body of work explores the emotional response to grief, loss and the journey of healing, a journey that ends with the return of laughter. Entry forms must be submitted by 7 January 2019. The exhibition will be held at Wollongong Corps from 18-29 January 2019.